It is with great sadness that we announce the passing of our dear friend Ed Pingul, who died on Thursday, June 23. Ed, father of Bryce (2014 Vocalpoint graduate) was a devoted father, husband and friend. He dearly loved the Northwest Choirs, and almost never missed a performance. Ed was a deeply committed volunteer. Whether serving as head usher for performances, coordinating risers for Lessons & Carols, or helping set up for the Gala, Ed’s warm smile and welcoming demeanor were always present. Ed was wonderfully supportive of our members, and delighted in each of their successes. Our thoughts and prayers are with his wife Geri, son Bryce, and daughters Sophia and Corinne. Ed was a person who truly made this world a better place, and he will be deeply missed. Edwin Ralph Soto Pingul, 57, passed away on Thursday June 23, 2016. Born in Honolulu, HI on May 10, 1959 and raised in Tacoma, WA. Ed was a charismatic and charming person, a loving husband and father, coach, proud BIF brother, and avid Husky fan. He was an active member of the Issaquah Rotary and Chamber of Commerce, and proudly served as the King of Issaquah in 2015. 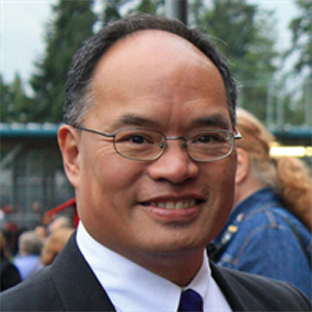 Ed is a graduate of St. Francis Cabrini, Clover Park HS, and University of Washington. He met his wife Geri of 28 1/2 years in the Spring of 1983. They married in December of 1987 and have spent the last 28 years focused on building their life together and raising 3 remarkable children. Ed grew up in a large, loving, and raucous family filled with his siblings and extended family. He excelled in all he attempted, from sports (all sports but his love was golf), academics, music (choir), to art, and strived for perfection and predictably always achieved it. As a middle child, Ed was always quiet and calm but there was something about him that always drew people close to him. To say he was popular as a child is an understatement. He forged many, many friendships in his youth, that he not only maintained, but solidified and strengthened as an adult. Ed was a warm and caring man, open and honest. He never considered anyone an acquaintance, but instant friend, rarely going anywhere he didn’t run into one of those friends. Ed was a proud father of his three bright and talented children. He took an active role in raising his children, and coached them on and off the field or court, never failing to provide a lesson learned before and after an event. Through his lessons and actions he taught his children what it meant to love and support each other and be a responsible citizen. He utilized his artistic skills in making tremendous birthday cakes for our celebrations and making rooms and play-spaces magical with his wall paintings. Since the end of his college days at the U of W, Ed was part of a close-knit group of friends called ‘The BIF’, consisting of the families of ten men he had known since high school and earlier. BIF stands for the Bachelor Incentive Fund, which was an actual pot of money rewarded to the last of the ten men to get married, largely as a sympathetic gesture to the “winner”. Among the ten men, it took twenty years to determine a winner. More importantly, for Ed and the other nine members, it provided each with a wonderful reason to maintain relationship with one another over the various stages of life. In 2003, with the eventual winner declared (Ed had long ago lost out due to his marriage to Geri (Hoffman) Pingul), the BIF group determined that it would be fruitful to continue the relationships that had grown over the prior 20+ years. To that end, the BIF families have continued to meet every two years at various locations around the Pacific Northwest. To this day, this collection of BIF families have continued their relationships now for nearly 35 years, building and maintaining friendships that went to the heart of the philosophy Ed always sought to uphold. Ed is preceded in death by his father Graciano Pingul, Sr. and sister Norie Pingul Ramirez. He is is survived by his mother Maria Soto Pingul; wife Geri Hoffman Pingul; children, Sophia, Corinne, Bryce; sisters, Belle DeLeon and Ellen Donato; brothers, Reynaldo, Graciano Jr., Dennis, Glenn, and Russell Pingul; and his many nieces and nephews. A Wake will be held Saturday through Monday, July 2-4 from 1:00 PM – 7:00 PM each day located at Mountain View Funeral Home located in Lakewood, WA. The Funeral Mass is scheduled for 11:00 AM, Tuesday, July 5, 2016 at St. Francis Cabrini, 5715 108th St SW, Tacoma, WA. In lieu of flowers, please consider a donation to the organization that is part of our family’s village, of which Ed loved and supported, Northwest Boychoir & Vocalpoint! Seattle (The Northwest Choirs) http://live-nw-choirs.pantheonsite.io/give/. Please indicate “In Memory of Ed Pingul” in the memo.